Discharging a contract by mutual agreement is called rescission. Rescinding a contract occurs when all the parties to a contract agree that the contract is null and void. When parties mutually cancel a contract, they have no obligations toward one another under the contractual terms, and breach of contract claims are negated. While rescinding a contract can be done orally, it is best to put the rescission into writing in a contract titled "Mutual Rescission of Contract." Date the mutual agreement to rescind the original contract in the first paragraph of your "Mutual Rescission of Contract." Identify the parties by formal names. State in the second paragraph that the parties mutually acknowledge and agree on two facts: a previous contract existed and the parties to the previous contract and to the current contract desire to rescind the original contract. When referring to the original contract, include the date on which the parties entered into the contract and indicate that a copy of the original agreement is attached to the rescission contract. State that the rescission contract shall be binding on all parties, their agents, successors, assigns, and/or personal representatives. In the third paragraph, state that the parties by virtue of mutual agreement, rescind the original contract as of the date of signing. Indicate that the parties are relieved of and cease to have any obligations toward one another under the original contract. Indicate in the fourth and final paragraph, which state law guides the agreement. Usually this is the state in which all, or a majority of, the parties to the agreement reside or do business. State that the document constitutes the entire agreement between the parties. Insert signature blocks for each party to the agreement. Type each name underneath signature lines. Include the company name and title with each typewritten name, if applicable. Provide a copy of the draft "Mutual Rescission of Contract" to all parties to the agreement. You should allow each party an opportunity to review the contract and propose any additions and/or changes to the language. Execute the contract. Persons signing the contract must be 18 years or older, of sound mind and have authorization to sign (if signing on behalf of an individual or a business entity). Witnesses to the contract's execution are not needed in order for the contract to be valid and enforceable. Lynne, Robyn. 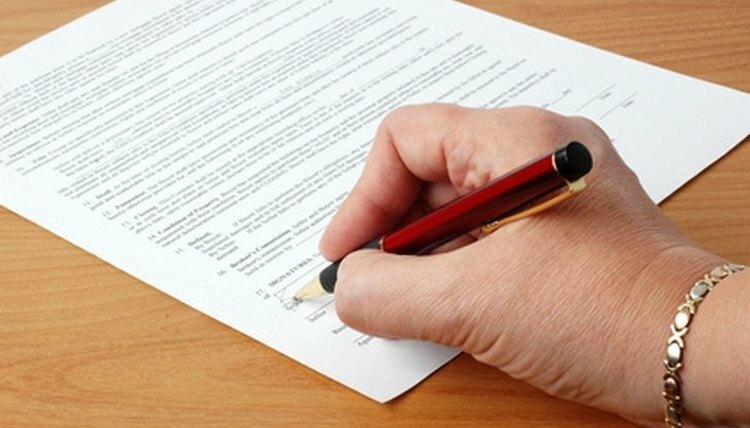 "How to Discharge a Contract by Mutual Agreement." , https://legalbeagle.com/6527925-discharge-contract-mutual-agreement.html. Accessed 20 April 2019.